Here is a dish that will satisfy your cravings for pizza and help you limit your calories by avoiding the dough. This recipe uses eggplant slices instead of bread crust as the foundation for the pizza and is ideal to use as canapés for a party. Preheat oven to 400 °F (204 °C). Cut eggplant into 1/2 inch thick rounds. Brush both sides of the eggplant slices with olive oil and sprinkle with salt, black pepper, and garlic powder. Put eggplant slices on a baking sheet, and place in oven for 7 minutes or until tender. Top eggplant with pasta sauce, chopped peppers, and mozzarella cheese. 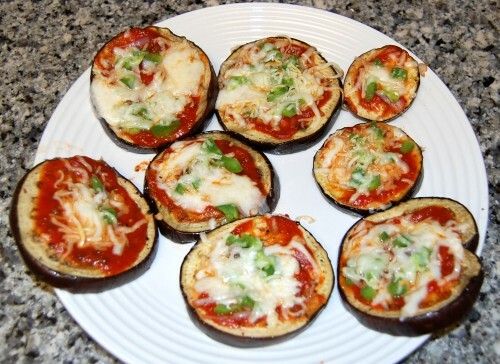 Continue to bake eggplant pizzas until the cheese is melted. Serve.